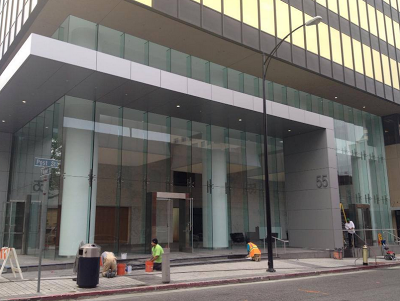 If you have driven by Market Street lately, you may have noticed the shiny new facade of 55 Market (aka, the gold building). I think it looks pretty sleek, but with so much empty space in the lobby I wish they added a new retail sport or two. Regardless, this is a huge improvement over what was there before and will compliment One South nicely. Only helps if you don't look up. Those gold windows are an abomination. That new lobby facade really clashes with the gold windows. Wish they were refacing the entire building. Walk by it daily. It took forever and it looks totally outbid place. How could they not have a plan to update the rest of the building? And the dump next door to it needs to be leveled. "On your right you will notice the very dramatic newly enclosed lobby for 55 S. Market Street. They are the latest example of the remodel arms race that is sweeping through downtown San Jose. The lobby cured a number of issues including the elimination of the wind tunnel effect of the former lobby entrance in addition to creating separate secure entrances for the IRS located on the ground floor and the rest of the building tenants. The lobby also helps make a statement at the corner and changes the character of the property." Yup the building next door (corner of Market/San Fernando) is horrible. It'd be the perfect place for a new tower (max height possible). Keep the Gold façade intact since it's probably the only true Gold building in the country, if not the world, with the exception of Trump's Gold hotel in Vegas. It's a nice looking building like a bumble bee.